Our Managing Director, Neil Kermode, reflects upon returning home from his holiday in Canada. Last week gave a rare and valuable insight into how the marine industry is progressing. Whilst on holiday in Canada I had the opportunity to see first-hand one of the 16m diameter OpenHydro open centre turbines earmarked for the Bay of Fundy. The holiday had been booked after visiting Nova Scotia in 2014 for the ICOE conference as I liked Halifax and our brief trip out to Parrsboro to see the FORCE site whet my appetite for this side of Canada and the ‘Maritime Provinces’. So as we pored over the maps in the spring for our touring route we put a pin in the map at St John in New Brunswick and selected a down-town hotel. Scroll forward six months to last week and our visit to the area for two gloriously e-mail free weeks. When we booked I never expected to see this new giant machine during our holidays. However as we stood in our hotel there it was just across the harbour! And boy is it big! The sheer scale of the device only really became apparent when I had the privilege to be shown around the vessel by Kevin Boudreau of OpenHydro. Standing on the cross deck and looking into the maw of the turbine one could clearly see the finessing of details brought about by repeated test and experience. I felt proud that so much of that had been piloted with us in ‘Old Scotia’ at EMEC. A few weeks earlier James Ives and I had met the new Scottish Energy Minister Paul Wheelhouse MSP and his team in Orkney. The point had been forcefully made that the opportunity to start small and learn had been invaluable to OpenHydro. The smallish scale (6m diameter) at EMEC had allowed repetition at an affordable cost and enabled innovations to be tested and techniques developed and honed. As our longest tidal client EMEC has seen OpenHydro grow from a handful of staff to a significant company. 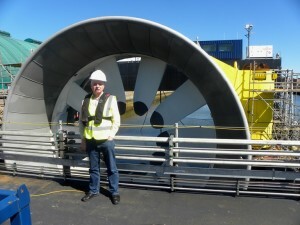 I was here when the first open centre turbine arrived in Orkney and was shown proudly around it by James. A lot has been learnt and a lot has changed, but it is also interesting to see how solid the concept has been and how much it looks the same… just bigger. 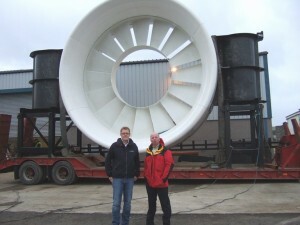 And of course it is not just the turbine; even the installation vessel was first dreamed up as a result of experience at EMEC. The OpenHydro Installer deployed its first gravity foundation at EMEC and the experience gave rise to the 2nd vessel (Triskell) used in France. And then there is the cable handling, the safety procedures and the myriad of other details that are needed to build an industry. All aspects need to be thought about, worked out, tried, tested, refined and repeated…. And it takes time, but in the right learning environment it takes less time than it could. And of course nearer to home we also see the next generation of Andritz machines going into the Pentland Firth in Atlantis’ Meygen site. Both companies have been berth holders at EMEC and we also feel justifiably proud of the part EMEC has been able to play in the lessons they have learnt. So 11 years after EMEC built its tidal site and 10 years after its first customer put a toe into the water we are seeing three ‘graduates’ of EMEC facing their next real challenges. We wish them luck and are waiting to hear not only how they get on, but how we can help them and their successors in this brave new endeavour.